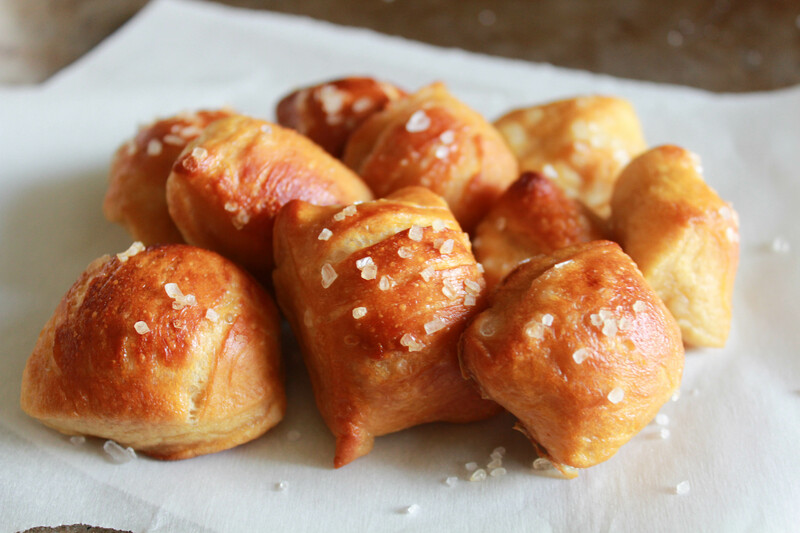 I made these soft pretzels to munch on while watching football and they made the perfect game day snack. You can make these into any shape that you want. We really like them in small, bite-size form because they are easy to dip and fun to eat. We dipped these in a white cheddar cheese sauce which was quite tasty but we found them to be just as good on their own or dipped in mustard. Because pretzels are made with a yeast dough, they take a little bit of time to make, so you will need to plan ahead. I got these started in the morning and we had them ready to eat by game time. Soft pretzels start with a yeast dough that has to rise for an hour. It is then cut and shaped, briefly boiled in baking soda and water and then finished off in the oven. Each of these steps is necessary to get that familiar pretzel taste and texture. 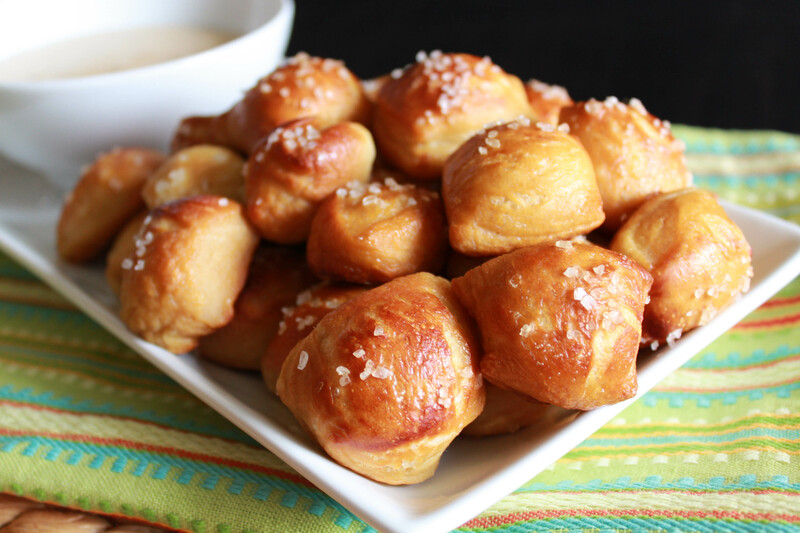 Fair warning, this recipe makes a lot of pretzel bites, a little over 5 dozen! This is the time to invite over some friends or drop some off to your neighbors. These are best eaten the day they are made. And if you are making these for a game day snack, at least if your team loses you can drown your sorrows in freshly baked carbs (we might have done just that). In a stand mixer fitted with the dough hook, combine the warm water, brown sugar, yeast and butter. Mix until combined and let sit for 5 minutes. Add the salt and flour and mix on low speed until combined. Increase to medium and knead until the dough is smooth and pulling away from the sides of the bowl, about 4 minutes. Add additional flour, a tablespoon at a time, if the dough appears too wet and sticky. Remove the dough and knead into a ball on a lightly floured surface. Oil a bowl with vegetable oil, add the dough and turn it in the bowl to lightly coat it with oil. Cover with a clean towel and place in a warm spot for about one hour, until the dough doubles in size. Once the dough has doubled in size, preheat the oven to 425. Grease a baking sheet or line it with a silicone mat, set aside. Bring the water to a boil in a large pot and slowly add the baking soda. Place the dough on a flat, lightly floured surface and divide it into 8 equal pieces. Roll each piece into a rope measuring about 20 inches. Cut the rope into 1 to 2 inch pieces. Boil the pieces in the baking soda water in batches (I did one rope worth of pieces at a time). Boil for 30 seconds and remove the pieces with a slotted spoon. Place them onto the prepared baking sheet, making sure they are not touching. Brush the tops with the beaten egg and season liberally with coarse salt. Bake in the oven for 15-17 minutes, until golden brown and cooked through. 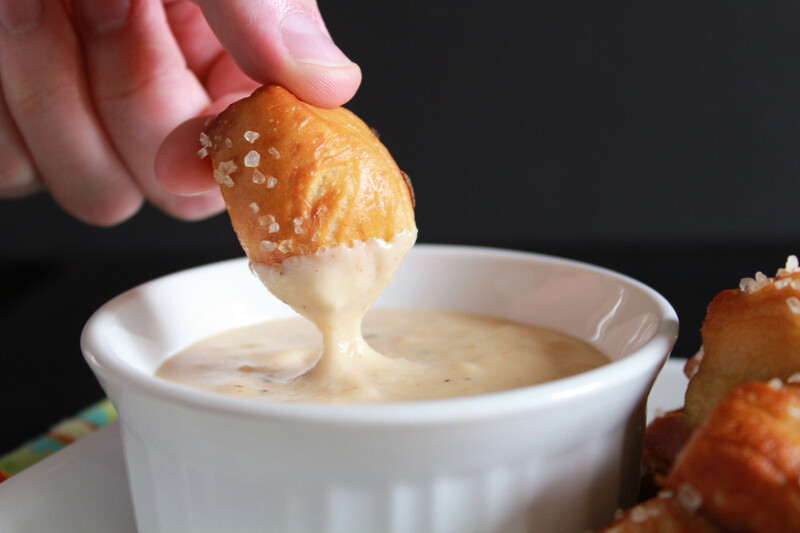 Serve with cheese sauce, mustard or any other dip you like. In a saucepan over medium heat, melt the butter. Once melted, whisk in the flour and cook for a minute or two. Slowly add the milk while whisking. Bring to a simmer and cook until the milk has slightly thickened. Add in the cheddar and cream cheese and whisk until the cheese has melted and the sauce is smooth. Season to taste with salt and pepper. This sauce will firm up as it cools. Serve it immediately so it stays smooth and creamy. If you need to keep it warm for a longer period of time you can put it in a fondue pot or a small slow cooker.